Caruso Affiliated will develop Caesars Entertainment’s Linq project, unhealthy shown here in a rendering, on the Las Vegas Strip. Lost in last week’s hubbub about billionaire developer Rick Caruso masterminding a $550 million shopping-and-dining complex on the Las Vegas Strip is that Mr. Caruso is rolling out a new line of business. 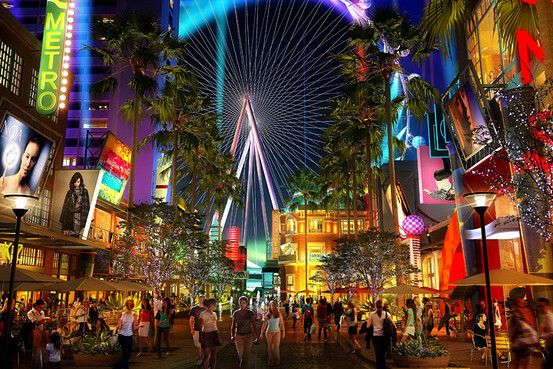 Caesars Entertainment Inc. has enlisted Caruso to develop the Linq, Caesar’s long-planned project including shops, restaurants, entertainment venues and a 550-foot-high Ferris wheel between the Imperial Palace and the Flamingo hotels. Caesars intends for construction to start in September or October. The project is the first that Mr. Caruso’s closely held Caruso Affiliated, based in Los Angeles, will develop but not own. His company controls retail and residential complexes, including the Grove in Los Angeles and the Americana at Brand in Glendale, Calif. Mr. Caruso also attracts headlines for his on-again, off-again consideration of running for mayor of L.A.
Now, Caruso will dabble in developing projects for others for a fee — and sometimes a slice of equity. Mr. Caruso said he has been approached “dozens of times” to quarterback development work for others, including some projects abroad. Teaming with local partners who provide the capital and local expertise will allow Caruso to pursue some of those opportunities, he said.